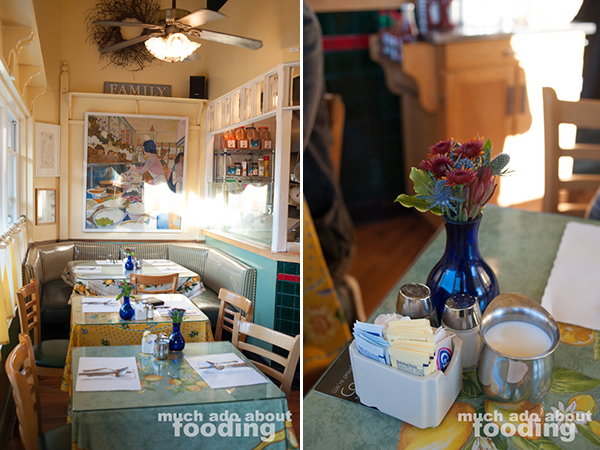 San Francisco's Mama's on Washington Square - Community Favorite or Tourist Attraction? We missed going to Mama's on our first trip to San Francisco not because we forgot about it; no, we took one look at the line wrapping around the building and up the street and decided we'd try our luck elsewhere. It constantly pops up in searches for favorite breakfast spots in the iconic city so eventually, we decided we'd need to give it a try. Also, if the lines are long, there must be a reason right? Our recent SF trip found time for us to snag spots before the opening hour and even then, there were quite the number of guests ahead of us. When we started moving and were the first people to have the door shut on us due to capacity, we wondered if it would take much longer; luckily, it was preemptive and we made it into the first round of people! 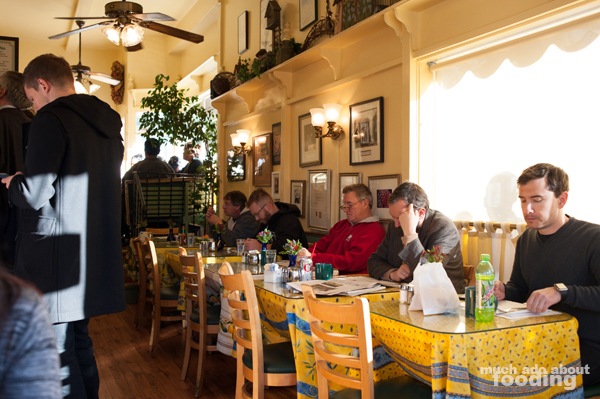 Surprisingly, for an established place with such acclaim, Mama's is a cash-only business so keep that in mind before you enter its quaint doors. The decor is darling, and the entire design makes you feel like you certainly stepped into a home and kitchen by someone you would call Mama even if she wasn't your own. Artwork and photographs lined the walls, giving you curious sights to browse as you waited to put your order in. Oh yeah, of note is that you just place your order and they bring the food to your table later...without giving you a buzzer or table number. They just know - pretty neat. Anyhow, the restaurant seemed to fill up quickly with two types of parties: the lone, contemplative native (I assume) and the cheerful group of visitors who had also heard much of the place. The line outside was merely to get into the line inside where you could contemplate the menu while watching the open kitchen (well, barred by some glass) work on slinging multiple breakfasts in efficient time. We saw the portion sizes and opted to just have single entrees each rather than stock up on juices, mocktails, additional sides, or starters. Duc chose from the M'Omelette's menu which is served with Mama's grilled potatoes and choice of toast - he went for the S.O.B. (South of the Border) which came with Spanish chorizo, black beans, homemade salsa, and Pepper Jack. 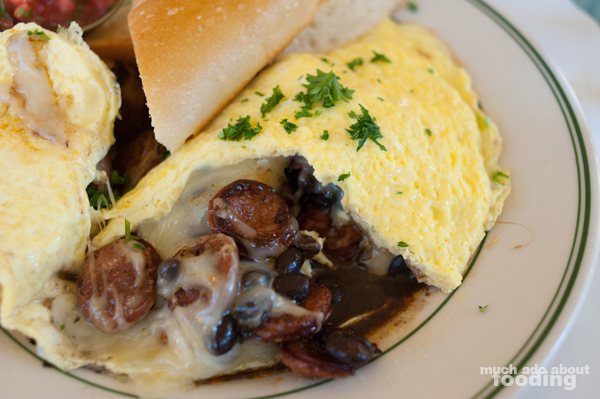 The omelette was generously full of its gooey chorizo and black bean goodness but lacked a certain panache to make it stand apart from other breakfast staples; the eggs did come out beautifully though. I, on the other hand, had to get my mouth onto one of Mama's Benedicts because benedicts entice me anywhere they are available. 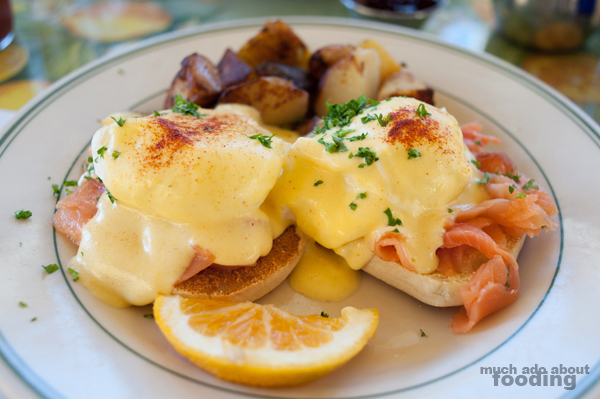 Orders from this menu section are built from two poached Petaluma Farms eggs served on a toasted English muffin with hollandaise sauce and Mama's grilled potatoes. I chose the Norwegian Smoked Salmon bit and was greeted by two healthily wobbling eggs quickly. 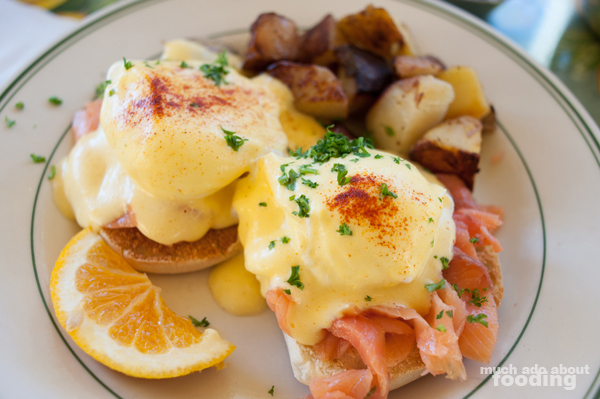 They themselves were a treat but the hollandaise erred on the too-lemony side (ah, my mouth is salivating now thinking about the tang!) and the smoked salmon too thick instead of being delicate. I did enjoy the accompaniments though, and the muffin possessed a great texture to meet the other, softer substances. 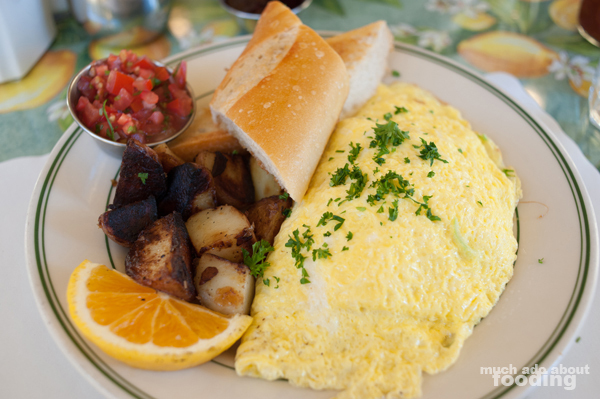 If you personally want to give Mama's a try, find the restaurant at 1701 Stockton Street, San Francisco, CA 94133 and come to your own verdict. After all, there's a reason they are frequently visited - perhaps our particular orders couldn't enlighten us just quite but yours will.